Spring invites you to continue enjoying outdoor activities, but it's time to store away your skis and get out on the golf courses and hiking & mountain biking trails. Bike parks are scheduled to begin opening late-May who also offer other family recreation attractions. 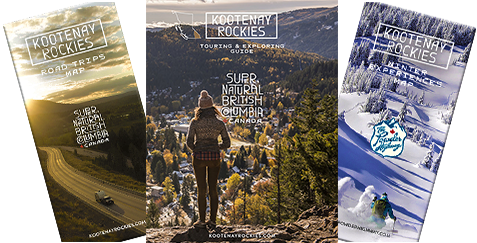 The Kootenay Rockies is British Columbia's Mountain Playground! All inclusive Yoga Experiences at the gateway to the Valhallas in the pristine Slocan Valley. Six days starts at $1,099; 4 days starts at $699. The Kaslo Hotel is celebrating 10 years of being an award winning, heritage designed, boutique hotel. One night in a luxury room for 2 w walkout balcony & $40 pub credit for $149/night. 1-866-823-1433 Valid until May 12, 2019. Long Stay Specials - FERNIE LODGING CO.
Great discount on longer stays; Stay 7 nights; pay for 6. Fernie Lodging Co. has over 100 properties to pick from! Valid until November 30, 2019 with blackout dates. Book at the award winning BW Plus Columbia River Hotel and get rewarded. Each night reserved includes a $20 dining voucher to the on-site Foxy's Fine Food & Drinks. 1-800-465-6682 Valid for 2019. Select Fairmont Hot Springs properties are available at a significantly reduced weekly rate. Special rate is available for bookings made within 28 days of arrival. Nipika Mountain Resort on the edge of Kootenay National Park offers a Mountain Bike Clinic. $495 per person includes meals, coaching, lodging and rides. Two Nights and One Round of Golf. Stay between April 30 and October 30, 2019. Book by June 15, 2019 and save 20% on lodging. Spring has arrived! Stay at the Adventure Hotel this April and save, save, save on your accommodation. Discounted rates available including the popular 3 for 2 rate special. 1-888-722-2258 Valid during April 2019. Kicking Horse Mountain Resort. Stay between April 30 and October 30, 2019 and save up to 15% on lodging. Book a 3 night stay by June 15, 2019. One night stay in a standard guestroom, $25 gift card to Conrad's Kitchen & Grill or Don Agave Cantina, (both on-site) 2 passes to the Radium Hot Springs pools. Three nights in the Bear Lodge, scenic raft trip, barbecue lunch and a visit to the Grizzly Bear Refuge. Package price $1,829/based on 6 people sharing. Stay 3 nights, get your 4th night free. Valid at Panorama Mountain Resort May 15-22, 2019. Valid in Fairmont Hot Springs October 9-16, 2019. 1-877-646-5890 Please inquire for pricing. Meadow Creek near Kaslo and Nelson. Talus time in the summer and fall; hiking, wildlife observing and nature viewing. Package includes helicopter transport and 3 night stay. $1,435/pp. Valid from April 19 to Oct 31, 2019. Bighorn Meadows Resort invites you to escape the hustle of life with paddleboard instructions, yoga classes, delicious food and wonderful lodging. Starting at $435/pp. 1-877-344-2323 Valid August 9-11, 2019. Valid during 2019 golf season. The Golden Golf course packages with a number of community accommodators. Check out the selection online and golf Golden this season. Choose from a number of packages that combine massage with body & facial care. Includes aromatherapy steam room, hot spring hot tub, robes and more. Valid during 2019; blackout dates apply. Set in the Rocky Mountains, Fernie is a pleasure to explore and experience; a mecca for biking, hiking, rafting, fishing & skiing. Check out the number of Packages and Deals being offered by a variety of businesses. Treat yourself and explore natural wonders at Island Lake Lodge. From hiking, spa treatments, acclaimed food & wine, wonderful accommodation and setting. 250-423-3700 Starting at $467/couple. Valid June 7 - Oct 7, 2019. Five-night bear viewing holiday. Head out into beautiful, remote terrain to view totally wild bears. Starting at $2,350. Excellent meals and luxury cabin lodging. Valid during May & June 2019. Kicking Horse Mountain Resort offers 15% off lodging when you book a summer adventure. Activities include Grizzly Bear Refuge, Via Ferrata, whitewater rafting, golf and more. 1-800-258-7669 Book by June 15, 2019. Stay in any Fernie Lodging Company vacation rental property this summer and receive 50% off your third night. Valid for stays until November 30, 2019. Book your getaway to the Fernie Alpine Resort by June 15, 2019 and save up to 10%. Valid for stays between April 30 to October 30, 2019. Spring Sale: $20 per night off all rooms until May 16, 2019 at the upscale, downtown, out of the ordinary Cloudside Hotel in the beautiful city of Nelson. Snow Valley Lodging offers rooms, suites and tiny homes. Book direct and get 10% off their Best Available rate. Their courtesy bikes are a great way to explore Fernie. Free coffee with breakfast at Rel-ish Bistro. Stay at the Cloudside Hotel and get coffee at one of Nelson's finest restaurants for free. Package price starts at $450. Valid May 10&11, 2019. Spring Special of 15% off until June 10, 2019. Save 20% on stays of 5 nights or more at the brand new Brooks Creek Ranch - modern luxuries in a natural environment. Use promocode: SAVE20. 1-866-288-1418. Starting at $328 for 2-night stay. Valid until June 29/19. Ainsworth Hot Springs, Balfour, Lardeau, Kaslo, Meadow Creek & Nelson - Check out the number of Packages and Deals being offered by a variety of businesses - from world-class adventures to great dining & lodging options.